Packaging is a means of ensuring the safe delivery of a product to the ultimate consumer in a sound condition at the minimal overall cost. Packaging not only differentiates one brand from another but also, at times, gives a preview of the product being sold. Although it is a subject of recent technological origin, the art of packaging is a sold as the primitative humans. Packaging is the science, art, and technology of enclosing or protecting products for distribution, storage, sale, and use, also refers to the process of design, evaluation, and production of packages and can be described as a coordinated system of preparing goods for transport, warehousing, logistics, sale, and end use. Packaging contains, protects, preserves, transports, informs, and sells. In many countries it is fully integrated into government, business, institutional, industrial, and personal use. The continual technological growth systems have undergone significant changes in recent years. A lot of packaging process has been streamlined to give a more scientific and rational approach. The role of packaging continues from the coordinated system of preparing goods to the end use. It has become a big tool for launching new specific products in different shapes and sizes. The packaging industrial growth has led to greater specialization and sophistication from the point of view of health (in the case of packaged foods and medicines) and environment friendliness of packing material. The demands on the packaging industry are challenging, given the increasing environmental awareness among communities. The packaging industry is growing at the rate of 22 to 25 per cent per annum thus is to play a unique role in preserving the wealth or value created by many industries. This book describes the techniques and process behind packaging of different specific products which are used in our day to day life. The specific products include cereal, spices, edible oils, drinking water, chocolate and confectionery, fruits and vegetables, marine products and many more. Some of the vital contents of the book are adhesives for packaging industries, factors affecting adhesion, tin plate containers for foods, pharmaceuticals and cosmetics, tin plate usage in packaging, packaging of cereals and cereal products, trends in packaging of spices and spice products, packaging of edible oils, vanaspati and ghee, metal containers for food packaging, packaging aspects of sugar and chocolate confectionery, packaging for irradiated foods, packing of meat & meat products in tin containers etc. This book is an invaluable resource for all its readers, entrepreneurs, scientists, existing industries, technical institution, etc in the field of packaging. Food Irradiation in the U.S.A.
What action should Food Processors Take? B. Combination Board-What is it? 66. "Quality Control-Specifications and Performance Requirements of Fird Boxes"
In this world of fast changing life styles, consumers prefer products to be lightweight, shatterproof, cheap, aesthetically appealing, easy to handle, with good protection. The only answer to everything is plastics. Plastics have, in fact, revolutionised the whole world in the past three decades. They have become part and parcel in every walk if life. Flexible packaging materials such as polyethylene, polyvinyl chloride, polypropylene, polyester films play a major role in almost all the industries-especially food packaging sector-Biaxially Oriented Polypropylene (BOPP) film is one among them. BOPP film suitable for food packaging industry is generally a coextruded, heat-sealable film though non-heatsealable films are also used. Coextruded, heat sealable films are used as a single web for packaging of products unlike polyester which cannot be heat sealed on its own and warrants a second web to be laminated. Since sequential orientation by stenter is the most commercially employed process for the manufacture of BOPP films, this will be discussed here. Homopolymer polypropylene is dosed with various functional additives such as amides, ethoxylated amines, stearates etc., to reduce the film's coefficient of friction and to increase static charge dissipation rate. It is also mixed with various fillers such as talc, calcium carbonate and pigments like titanium dioxide to provide different shades and colours to the film. Polypropylene with requisite additives, fillers, pigments is melt coextruded as a thick sheet. Through one or more satellite coextruders a random copolymer of polypropylene or other terpolymers is melt coextruded on either one or both surfaces of the homopolymer sheet. The homopolymer core layer, which is generally between 70-90% of total thickness, provides mechanical strength, optical properties, reduction in density (in certain cases) etc. The copolymer skin layers which may contain the above stated functional additives, in addition may also contain anti-blocking additives. These skin layers render the film heatsealable, improve optical properties, etc. The sheet, thus extruded, is solidified by passing it over a chill roll kept in a water bath. The cast sheet is then passed over several heated, chrome-plated rolls, which pre-heat it. After achieving sufficient heat, it is passed over two or more pairs of rolls in which one set of rolls rotate at faster speed than its proceeding rolls. Because of the difference in circumferential speed, the film is oriented in longitudinal direction. The orientation is generally to the tune of 4-7 times. The mono-oriented film is then clipped by clippers which carry them into a hot air circulated oven. The clippers are placed over a parallel laid chain track. After sufficiently heating transverse direction orientation to the tune of about 7-10 times, the biaxially oriented film is then annealed to retain the oriented stresses, cooled to room temperature, unoriented gripped portions are trimmed, corona treated to enhance surface tension and wound in jumbo rolls (Fig. 1). Polypropylene has the lowest density of 0.095 g/cc of all the plastics available so far. In a special grade of pearlised BOPP film, the density is further reduced to 0.700 g/cc apart from providing a pearly aesthetic look, light barrier, etc. Owing to the lowest density of PP, the yield of the film is more than other films and hence economical. Biaxial Orientation of Polypropylene enhances various properties over conventional cast or tubular quenched PP films. The mechanical strength, dimensional stability, stiffness, non-tearability, optical properties, barrier properties, etc. are greatly improved owing to biaxial orienting process. Table-1 provides comparative property details of various films. It provides higher surface area per unit weight which makes it cost effective. It has very low moisture transmission rate than other packaging films which improves the shelf life and retains crispness of the food products sensitive to moisture. It has combination of excellent slip and optical properties. The high gloss and excellent clarity provides good aesthetic appeal whereas controlled slip properties make it suitable to perform well on various FFS, overwrapping and converting machines in order to improves or maintain well on various FFS, overwrapping and converting machines in order to improve or maintain high productivity. It's high tensile strength, low elongation and thermal shrinkage makes it suitable for processing on high speed printing, coating/laminating and other converting machines. It can be tailor made to suit various customer needs which may be combination of any of optical/surface, optical/barrier and optical/mechanical properties etc. It is non-reactive or inert due to olefinic (hydrocarbon) nature which makes it suitable for safe use in food and pharmaceutical industry. It is also suitable for common methods of sterilisation practised presently in the industry. The coextruded heat sealable films are preferred because they provide sealability in addition to barrier and better aesthetics without involvement of any additional coating or laminating operation thus making the package cost effective. It is recyclable and does not emit hazardous gas while reprocessing. The package should be able to protect the nutritional properties of the food until final consumption. Therefore, it is desirable that the package should have sufficient barrier to moisture, gas and light. The package should be cost effective. The package should be able to enhance the product sales appeal on the shelf and also be able to give all the statutory information. Hence, the pack should have good optical properties and printability. BOPP film has excellent clarity, transparency and gloss. The pack should be convenient to the consumer for opening, handling and storage. During handling and storage, the pack should be able to protect the food from crushing, breakage etc. It should also be shatterproof. The pack should be non-toxic. The contents of the pack should not migrate to the product packed in it and spoil its quality and cause harmful effects. Mechanical Properties: The mechanical properties include tensile strength, elongation, stiffness, tearability, etc. The mechanical properties provide sufficient strength to the film to undergo different converting operations such as printing, coating, lamination and packaging. Shrinkage: The lower shrinkage value of BOPP film ensures minimal dimensional changes with change in temperature. For a better machineability of the film on the machine, optimum values are required. A good control on the set of temperature range will help in obtaining a proper seal. Wide variety of BOPP films having sealing temperature as low as 90oC is available. Lower the seal temperature, faster will be packing machine speed. Good Optical properties: The optical property of BOPP film is as good as polyester film but superior to PVC, Polyethylene film etc. The BOPP film has excellent gloss, transparency and very low haze values making it suitable for print lamination and reverse printing application. Coefficient of friction: This is a measure of the relative difficulty with which the surface of one material will slide over an adjoining surface of itself or of another material. The static coefficient of friction is related to the force necessary to begin movement of surfaces, while kinetic coefficient of friction refers to the force needed to sustain the movement. Frictional properties of a film are important both during its passage through printing or wrapping machine and after being made up into bag, or over wrap. It is normally preferred to have controlled slip values of the film for better machine ability, because during the passage of the film through packing equipments it is subjected to variety of forces including some of which press the film tightly against flat metal surfaces. If the slip properties are lowered the path of travel of film through equipment can be arrested completely. The consequent strain in the film can lead to elongation and or distortion. Highly slippery film will not run properly on the machine and can lead to empty over wraps. It can also impair optical and printability characteristics of the film. Hence, a controlled slip is always required in the film. Treatment level: BOPP film is subjected to corona treatment to form a surface, receptive to inks, lacquers or adhesives. Though the treatment level reduces with the migration of additives to the surface of the film, still the treatment level remains sufficient for printing and lamination. As a thumb rule, if the surface tension of the film is at least 38 dynes/cm, it is considered to be suitable for printing, coating or lamination. (v)	Good Electrical Properties: Static charge: being of polyolefin nature, BOPP film has a tendency to develop static charge which many a times becomes for applications like printing and over wrapping. Films having high static charge create following problems in general. Jamming of film on machine due to attraction to steel parts and thereby causing scratches to the film. Antistatic additives are added during the production of BOPP. Further, better results can be obtained if "Static charge eliminators" are installed at strategic portions on the machines. 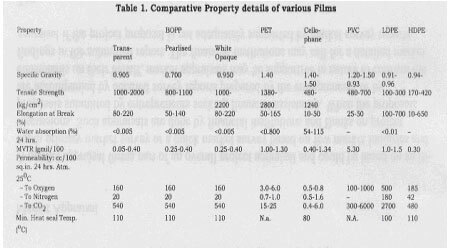 Good Yield: BOPP film being the film with lowest density (0.905 g/cc) provides more surface area for the same unit weight. It means that more number of products can be packed or over wrapped with BOPP film than with PET or PVC. Furthermore, a special grade called pearl luster film with still lower density of 0.70 g/cc is also available. Good Barrier Properties: Food compounds such as proteins, liquids and certain vitamins can undergo detrimental changes as a result of exposure of light, oxygen and moisture. The factors influencing deteriorative charges in food are given in Table 2. (a)Transparent & Opaque Non-heat Sealable Film: This grade of film is generally used in conjunction with wax-coated paper for biscuit packing. The low moisture vapour transmission rate (MVTR) of BOPP film renders the biscuit retains its crispness. If a opaque film is used, it further cuts down light penetration and protects the biscuits against U-V radiation, thereby fat and oil in the latter are not oxidised. Wax coated paper helps in sealability, giving printability and body to the pack. (b)Transparent Heat Sealable film: This grade of film is used in packing all snack foods oxygen transmission rate (OTR) of BOPP film is the choice for packing products such as potato wafers. Its excellent tensile strength, stiffness enables the film to be employed in any kinds of packaging systems whether vertical form-fill-seal (VFFS) or horizontal form-fill-seal (HFFS) or strip packing etc. Its inherent heat sealability is an added advantage. BOPP film's low elongation and good surface tension enable it to be excellently printed. Products generally packed in this film are biscuits, potato wafers (with nitrogen gas flushing), masalas, readymix recipes, cough lozenges etc. (c)Opaque Heat Sealable film: Generally, opaque films are white pigmented to act as a light barrier. The opacity of the film is 80-90%. A high oil and fat containing product is easily oxidised by U-V light leading to rancidity. Protection against light is also achieved, in addition to all the other properties of BOPP film. Again this is used in packing biscuits, chocolates, biscuit wafers, potato wafers, cough lozenges etc. Caking of loosely packed dehydrated foods. (d)Pearlised Film: Apart from being opaque, this film provides a shiny, eye-catching, pearly appeal. Further, its lowest density (0.700 g/cc) enables the convertor to pack more products per quantity of film. Coupled with these two unique properties, the pearlised BOPP film is widely used for packing chocolates, biscuits, biscuit wafers, toffees etc. (e)Super Seal: This is one side heat sealable film with high heat seal strength. The flowability of the heat seal layer and high heat seal strength is useful in packing products like powders where the pouch/pack can carry more load. Generally when powders are packed by vertical form-fill-seal technique, owing to the static charge developed during movement of the film and pouring of powder, certain particles get stuck throughout the area of the pouch. In such cases, those powders may also be present at the seal area. Superseal film can seal through those powders and retain the integrity of seal. Further, since its heat seal strength is sufficiently higher, more volume of product can be packed. This superseal film could be either transparent or opaque or pearlised. Products that can be packed are biscuits, masalas, readymix recipes, skimmed milk powder, etc. (f)Metallized Heat Sealable film: Metallization is a process of depositing a thin layer of metal over the film under vacuum. The metal generally used is aluminium. Earlier, owing to poor surface tension of BOPP films, a primer coating was essential for free anchorage of metal layer. Now, a special grade of BOPP film is freely available which does not warrant a primer coating and still can be barrier metallized. About 250-1000oA thick deposition of aluminium drastically improves the light, moisture vapour and oxygen barrier of metallized films. Further it eliminates the problems of pinholes, poor flex resistance often encountered in bare aluminium foil. The optical density of about 2.0 is maintained to achieve better barrier properties. This film either alone or as a laminate with other films is popularly used for packing of cream biscuits, stuffed biscuits, pan masala, scented supari, etc. Recently, atleast two or more BOPP film grades are developed viz. Metallized BOPP film with matte aluminium foil look, translucent film for reverse printing and lamination, heat sealable synthetic paper etc. With consumers' views and tastes keeping changing, more and more films are expected to be developed. The future may witness, a lot of coated BOPP films freely available. Among them could be PVdC coated film, PVOH coated film, acrylic coated film, coated film for high speed overwrap and packaging, etc. The shift will definitely be towards coated BOPP films possessing excellent water, gas and aroma barrier. LDPE BOPP (RP) LDPE/SURLYN Powdery materials, like starch, detergent, noodles, vermicelli etc. BOPP (SP/RP) Noodfles, Biscuits, other snack food products. BOPP (MET, HS)RET (RP) Cough, lozenges, candy etc. Pearlised BOPP BOPP Wax Paper Biscuits and other snack food products. SP = Surface Printing, HST = Heat Sealable, HS = High Speed, SURLYN = Modified LDPE. There are over 40 BOPP Film manufacturers in the world. Estimated global capacity is about 1.7 million tonnes per annum and the consumption is about 1.3 million tonnes. The growth rate of BOPP films worldwide is 810% per annum. This rate of growth is expected to sustain for the next five years as BOPP films are still fast replacing various other films and substrates. With the advent of newer technologies and developments, more grades of BOPP films may be launched which will further boost the consumption of these films in food packaging.